Jane McAlevey on Fight for 15, labor's crisis of strategy, and the difference between organizing and mobilizing. When it comes to the American labor movement, coverage is often either cynically dismissive or so optimistic one could be forgiven for wondering whether the last few decades of decline, confusion, and infighting had happened at all. Jane McAlevey, a labor organizer known for her work with SEIU in the 2000s, falls into neither trap. McAlevey’s first book, Raising Expectations and Raising Hell, uses her experience organizing in “right-to-work” states to advance a strategy to renovate US labor. With every critique comes a practical vision for how unions, organizers, and the rank-and-file can build a movement up to the task of confronting twenty-first century capitalism. I recently caught up with McAlevey to discuss these ideas. Below, we talk about what ails the labor movement, McAlevey’s problem with the terms “public” and “private” sector, and why we need to stop ignoring the rank-and-file. You’ve argued that organized labor today doesn’t face an external crisis of circumstances, but a crisis of strategy. Things are bad, but for instance if we look back at the ’30s or earlier, working and living conditions weren’t rosy but we still saw huge mobilizations and stronger movement than we have today. If we have a crisis of strategy, what are we missing? What strategies will work today? It’s an important question, and I should clarify a little bit. There are external factors; I don’t want to dismiss that. The changing nature of capitalism has made things very difficult, so have trade agreements and globalization. As a self-criticism, I think I sometimes come off completely dismissive of external conditions. I mean to put an emphasis on what we control. I’m fine to talk about globalization till the cows come home. We know it’s there; we know it’s a problem. The question is, what are we doing about it? I want to focus on a debate that we can actually change. If we do change our strategy, I think we can win again. The reason I pound so much on internal movement failure is because it’s in the movement’s control. We’re not going to change the direction of global trade tomorrow. What we can do tomorrow is sit up as a movement and decide we’ve got the wrong strategies. There has been this recognition in the last twenty years or so, in the USA in particular, that we have a crisis. The conditions are very difficult, the employer offensive is very difficult. The problem is that the way the US labor movement took the decision to look for additional leverage was to walk away from workers in the workplace and develop these very sophisticated, heavily staffed campaigns — staffed by, no offense, very educated white men who were given written tests in the application process on reading financial spreadsheets. And this was to hire people to think strategically in the labor movement. To me, this summed it all up. The question wasn’t: do you know how to talk to a worker? The development of the corporate campaign has been a colossal disaster. It’s an evolution in some ways of taking agency away from workers at every level inside the labor movement. The key strategic pivot we have to make is having a ton of faith in the capacities of ordinary rank-and-file workers and in the ordinary intelligence of workers. We have to prioritize our strategy on teaching, skilling up, and training tens of thousands of workers how to fight. Organizing isn’t rocket science, but it is a serious skill and a craft. We have to build an army of people in the field who can actually contend with capital on the local level. Not talking to workers and having a strategy that fundamentally avoided workers for several decades is what we need to change and what we can change. Or by heavy left rhetoric that’s inaccessible to people! I agree with you on this, but, first, we need to worry less about how we talk and worry more about listening. We stopped listening to workers and that’s part of disregarding the intelligence of ordinary people. The steps to a good organizing conversation, to a one-on-one, are a framework to how we can be talking collectively as well. There, it’s 70-30: 70 percent listening and 30 percent talking. Even the 30 percent talking is really agitational; it’s a series of specific questions that allow people to begin to self-analyze the crisis in their life. No one walks up to a worker and says, “You know what the problem with capitalism is? Your boss is really f’in you.” Workers know their boss is screwing them! The framework of the conversation is so important. People have to engage in self-discovery through face-to-face conversation. It’s not Facebooking, it’s not tweeting, it’s not any of this crap — those are mobilizing tools. Organizing tools and an organizing conversation are literally about a process of self-discovery. People begin to systematize and analyze what’s going wrong in their life . . . So it is people’s own experience, moving toward something broader, that can then bring them out together. Absolutely. People have to come to their own conclusion that there is something deeply wrong with the political economy system that we have. The main thing is that we have to get people to understand collective action. That’s the biggest challenge. This makes me think of Fight for 15, which is doing this in some ways, taking people and connecting them to something broader. In other ways, however, it seems to fall more on the side of what you call mobilizing. We’re seeing pushing of the core issue of minimum-wage increases but less actual organizing or larger collective structures coming out of it. Is there tension between these goals? How do these new movements relate to what you consider organizing? The entire focus of my next book is an analysis, through a bunch of case studies, of what I’m calling mobilizing models versus organizing models. The Fight for 15 stuff is very much a mobilizing model. Here’s the thing: we need to do lots of mobilizing, no question. I don’t want to be painted as anti-mobilizing. The problem is that there isn’t any depth to the Fight for 15 campaign. We call it the Berlin Rosen campaign: one hot-shot media firm that’s gotten something like $50 to 70 million from SEIU to paint, through social media, the illusion of a huge movement. Now, in Chicago they’ve got some real work on the ground going on, the original Sea-Tac campaign was a real organizing campaign — in fact, the very first real $15 campaign, was the one at Sea-Tac Airport. It was worker-led, there’s unionization coming out of it, and they won $15 now. They didn’t get a phased-in model that’s very complicated, where the minimum wage becomes $15 in 2022, when it’s no longer $15 because it isn’t indexed. We should be looking more closely at that original campaign rather than the mostly publicity, social media campaign we have now. Of course, it’s great that people are getting a raise. A dollar an hour here and there is a good thing, even if it’s phased in and complicated. The problem is that isn’t also doing any deep organizing. I was having this conversation with some people from the climate movement recently, and I challenged them on organizing. They said that the climate is going so fast that their job isn’t organizing — they’re all mobilizing. Everywhere I go, in every sector of the movement, people say that everything is so urgent that they’re just mobilizing and someone else has to worry about organizing. That is the problem: everyone is focused on mobilizing. There are very few places where people are actually trying to figure out how to have live, face-to-face conversations that allow for self-discovery by the working class. And where it is still happening, it tends to be in the labor movement. So for all the criticisms that it’s easy to heap on the labor movement, there is at least still real organizing going on. And that’s something that doesn’t happen through bombarding people through Facebook memes, where it’s just the same people seeing them. Right, that’s the problem when we’re doing just a mobilizing model: all we’re doing is talking to the already-convinced and we’re not doing base expansion. Real organizing is about focusing on people who are not yet convinced and not yet involved in our movement. We have to do several things to rebuild a powerful movement. One, we have to focus on the people who are not yet with us, and we’re not reaching them through Facebooking and tweeting. Two, we have to be clear that there’s a difference between an activist and an organic leader. If we want to get to scale, we need to recognize that there are organic leaders who have influence among our ranks, among ordinary people, and we have a very clear model to identify them. In the labor movement, we actually have these systematic methods for identifying leaders and distinguishing them from activists. We can then focus our training and political education work on the leaders because they themselves then become massive replicators of our work and bring along lots of other people. An activist-centric movement, which we have now, isn’t working. But the conditions for something broader are there. Especially since the crisis, people see what’s going on, they identify as working class rather than middle class and there’s this open space, but we’re not using it and not reaching people. We just talk to ourselves and it just makes me mad. I used to go to more anti-globalization protests, direct actions and other things when I was young, but I just stopped. We’re not winning if we’re just talking to all the same people. It looks great, we congratulate ourselves when we have a huge direct action, but it adds up to nothing. All I want to do is focus on the undecideds. So let’s focus on organizing, then. You’ve said that health and education are two really key, strategic sectors. With the decline of manufacturing or at least unionized manufacturing, some of the largest remaining organized workplaces are in these sectors. What is the strategic position of workers in these sectors and how can the labor movement build strategies around them? There’s several different components to why it’s so valuable to focus on health and education. From a social perspective, these workers actually matter: having high-quality healthcare and having high-quality public schools are good things. Beyond that, from a strategic, base-building, organizing perspective, health and education workers present several opportunities. First, they’re mission-driven: they care a ton about what they’re doing. So if the employer puts the squeeze on them, they’re going to fight. Second, these workers are non-tradeable — so far. They haven’t completely figured out yet how to replace a nurse or a teacher with a robot (they might be trying but it’s going to be a while despite the rumors) or how to completely offshore the work. Finally, health and education workers have these incredible organic links to the broader community. If the point of organizing is base expansion, then it’s important that these workers are not just ready to put up a fight in their own workplaces, but that they can expand the base into the community due to their special, organic links. What’s so important about the stories I like to tell is how quickly it’s possible to create the kind of transformation I’m talking about. When I went into Nevada, we had a demoralized — frankly, bad — union that workers had no interest in. In three and a half years, the whole union turned around and organized the whole market. We can have huge, transformational change in very little time when we do the organizing work right. We saw this in Chicago. 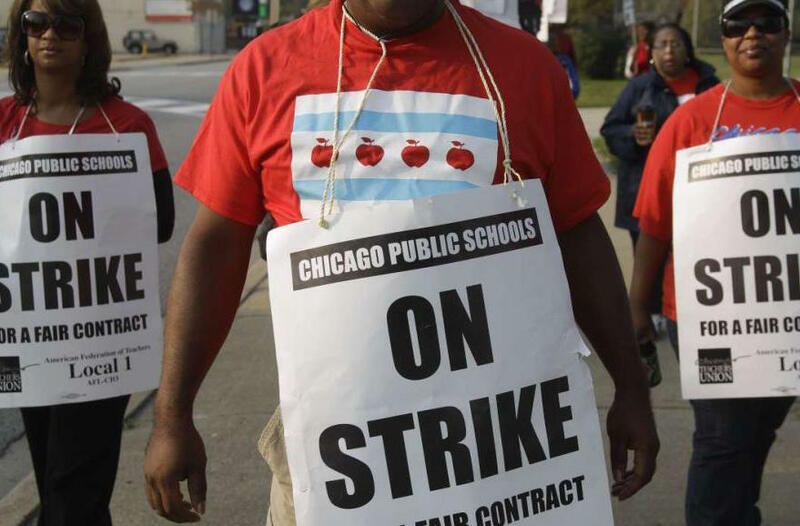 In a series of interviews I did, the Chicago teachers were very clear that they couldn’t win without the community. They invested a lot of front-loaded energy into building really strategic relationships all over Chicago. When that mayor [Rahm Emanuel] tried to turn the whole community on them with the kind of messaging we see so often against public sector workers — “I don’t have a pension, I want yours” — it didn’t work. Why? Because the teachers had done really strategic, brilliant, and principled work with their communities ahead of time. So, yes, I think we should spend a lot of time in health care and education in our movement. I want to look at the flip side of that: that in order to build the kind of community solidarity you’re talking about, we need to take on the resentment — cynically manufactured, but still very real — between private- and public-sector workers. The private-sector worker can say her pay is coming from the boss’s pocket, but it’s her taxes going to this nurse or this teacher. How do we fight this? This is a really good conversation to have and one we’re not having enough strategically. First of all, I reject the entire concept that there is a public sector, and even more profoundly, that there is a well-defined private sector. It’s a constructed narrative on the part of corporations and capital for very strategic reasons, including the one we’re talking about in terms of divide and conquer. In fact, corporations are sucking taxpayer monies; the subsidies are massive. If you do a serious full-cost accounting of the large corporations, it’s amazing what you’ll see. I repeat this line all the time: there is no private sector. I made this point in an article in the Nation once and a bunch of well-known lefty economists in the US sent me emails saying this is an important message. I’d never gotten fan mail from economists before! My line is: there’s just the economy. It’s socialism for capitalists in the US. Exactly! Here’s how we took this kind of divide and conquer on in Nevada. Very quickly after I got there — to organize private-sector hospitals in a strategic market — we realized a profound attack was coming on public-sector pensions. I remember waking up one of the first mornings and there was an editorial cartoon on the front page of the extremely right-wing major daily in town, of a firefighter putting out a fire with a hose that was empty save for a big bloat in the middle that said, “Firefighter Pension.” The fight was on. We started to hear the right-wing message coming from workers immediately: both from the public-sector workers as a form of self-blame (“yeah, we get too much”) and the workers in the so-called private sector hospitals. We realized we had to go straight at this, especially with a ballot initiative coming. What we needed was to have the private hospital workers — for example, registered nurses who are always very popular — leading the message about why taxes matter. So we organized a mass educational campaign. We created an educational team and a Powerpoint presentation; we began to train rank-and-file leaders. And then we had rank-and-file leaders and staff doing roadshows, where just in the first six months we talked to over four thousand workers in the union. We went straight at the idea of a subsidized private sector and argued that it’s just a game to take down the last pensions in America. We would take a dollar bill and break down for the private-sector health care workers what part of every dollar in their paycheck comes from public taxpayer money, what part from insurance, and what part from so-called private pay. There was almost no private pay, and this was really revolutionary for the private health care workers. This lay the groundwork for a campaign that would win them the same standard as the public-sector workers. We actually bargained defined-benefit pensions in private hospitals in Nevada. We said they need to win the same contract that the public sector has because that’s what every worker deserves. We took it on straight on. We had mass education; it wasn’t tweeting and it wasn’t Facebook. It was mass, full-on political education with rank-and-file workers. And it worked! We built an amalgamated union of public and private sector who stood up for each other at every turn in that state. We went at the division by doing radical political education. This seems to really get at what you mean by base expansion. You went outside that bubble. We’re not fearing the rhetoric. We’re going right at it. Let’s go! I’ll have that debate with anyone. We know the Right’s rhetoric, for example about taking away someone’s pension because someone else doesn’t have one, is ridiculous — but we run away from it because it seems like a hard conversation. Organizing is about having hard conversations. It is fundamentally about having hard conversations with people and not running away from hard issues. You can’t win a union campaign in the US environment if you don’t do that. Jane McAlevey has been an organizer and negotiator in the labor movement for over twenty years. While she continues to organize, she also writes for various publications and is the author of two books, Raising Expectations (and Raising Hell) and No Shortcuts, Organizing for Power in the New Gilded Age . Jane McAlevey on Fight for 15, labor’s crisis of strategy, and the difference between organizing and mobilizing.